From the 16-18 October you will be able to find us in Mâcon, France for the Vrac Tech Expo. There you will be able to meet Christine Coutard - Sales Support, Alexandre Vion - Country Manager for France and the French speaking Africa, and Sébastien Bessagnet - Technical Sales Manager. Stop by to booth no. C8 in Hall A to hear what Westrup can do for your business. Our French team is looking forward to share our knowledge on seed and grain cleaning equipment with you. We know, we are able to find the exact solution you need. 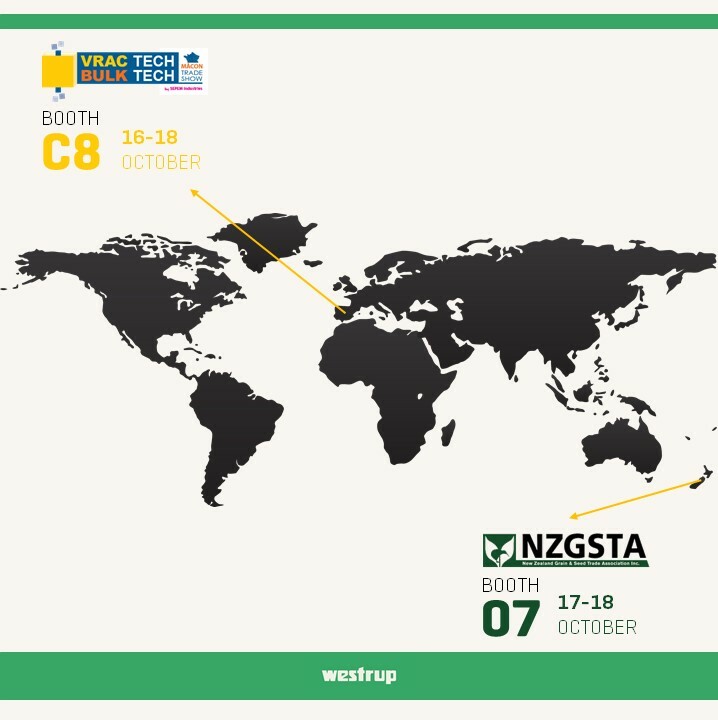 From the 17-18 October we are also represented at the NZGSTA exhibition in Christchurch, New Zealand. Here you can see what we can offer you. Our wide range of machines makes us flexible in designing the right solution to match your requirements.